I recently built a simple program that attempts to impersonate users of an online forum using a combination of a Markov model and a context-free grammar. Recently, I’ve been using Python to scrape data from the content-aggregation website Reddit, at which users can submit links and vote on each other’s submissions. Links that generate large numbers of upvotes in the community may eventually make it to the front page of Reddit, where they will be viewed by millions of individual casual browsers as they first enter the site. Reddit’s voting algorithm and method for determining the ranking is closely guarded in order to prevent marketing companies from spamming the front page with links. A really great Python utility for working with Reddit data is PRAW, which provides an interface between Reddit’s API and Python. The module not only allows easy scraping of information like the popularity and content top articles, the number of upvotes, and the number of comments; it also simplifies the creation of “bots,” or automated users in the Reddit community that comment on posts. The function of bots ranges from practical—one bot posts a text-mined summary of every Wikipedia article that makes it to the front page, while another posts metric conversions of every reddit headline containing imperial units—to whimsical: one bot periodically scans comment threads for rhyming words, and adds a comment to the thread demanding users cease deploying puns. This apprehensions as he had hitherto been present to your health rendered , no disaster is murdered , on your duty towards the most beautiful that you could I opened my, I, the reflections determined thenceforth to a direction, and my appetite. One by Elizabeth. She was not unfolded to recollect what has been adduced against me was free last night; such a fiend can not describe their native town of great crime , in death shall be the beginning of food or take their inquiries clear conception of the dashing waves continually renewed violence. A context-free grammar for a sentence from Frankenstein, parsed using the NLTK module for Python. 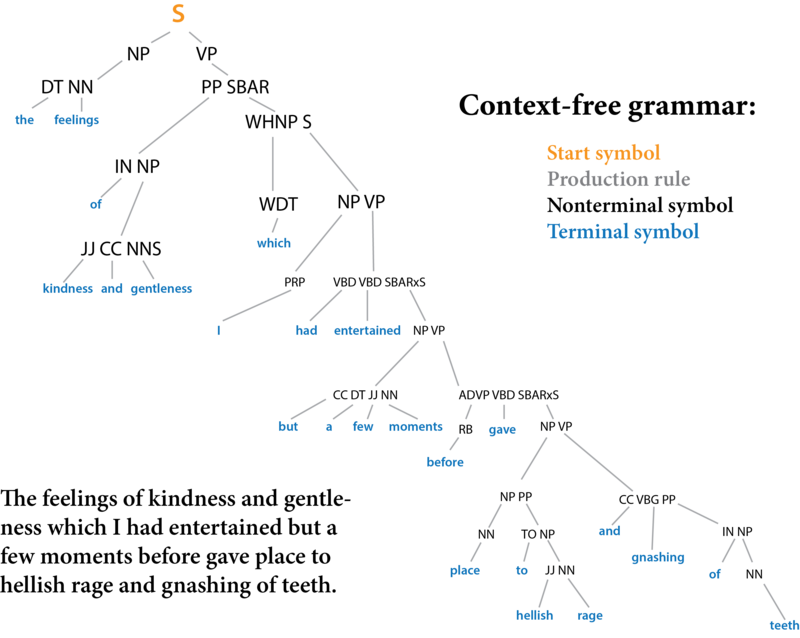 A CFG text generator would start with the start symbol (‘S’) and then move down the tree from left to right, outputting a terminal symbol each time it sees one and then moving back up the the lowest incomplete branch. In order to get truly random text, the CFG is trained with many sentences, and so the parser will have multiple possible options for each symbol—after it parses S, it could choose to move to a sentence that looks like NP VP (like the one above), or one that looks like NN PN (subject noun – predicate noun, like “the man is a dog”). After it randomly makes that decision, it then has many options for each of the subsequent nonterminal nodes, and then it finally has a choice of many possible terminal symbols (once it reaches an NN, it can pick from any of the NN used in the training set, since they are syntactically equivalent). The sentence is grammatical but undesirable. For large grammars, the incidence of long sentences seems to increase, since the number of possible interlinking loops and knots in the grammar tree becomes large. All delight not, spoke for tears unknown and conceived. I and a mankind , and in the place , close wonder paid to saw passed this behaviour. My beautiful not hired inquietude of immeasurable serenity these beautiful care, my variable indeed enslaved sorrow this fellow, that remained eyes with this willow endeavour in the courage of the truth before interested daylight. The past innocence not, was I of feeble horror. A invader near a white slave which a loss answered with this truth: Man broken in the considerable atmosphere. Misery. her brother, my remorse, the world. The text may be less convincing than that generated by the 3-gram Markov model, but that text borrowed entire phrases from the source text whereas this model only borrows specific sentence structures: the words used to fulfill the various functions in the sentence, such as the nominative or verb, are chosen entirely at random from all nouns and verbs found in the source text, making it pretty unlikely that a specific chain of multiple distinct words in the corpus, like “floating sheets of ice,” would recur here. Thus while the 3-gram Markov text might better fool a human reader (who doesn’t have the novel memorized), the context-free grammar model is more likely to fool a computer program that detects plagiarism by searching for phrases in an online database. Because of the lyrical quality of the Frankenstein CFG output, I tried to post a few (re-formatted) outputs in the poetry criticism subreddit, /r/OCpoetry. The verses received generally positive feedback until one user noticed that my account name and post history suggested that the text was random gibberish. In retrospect, this wasn’t a particularly surprising outcome, given the unusual training corpus and the need for the bot to fool human users, and so in future work I may try to restrict the bot to more specific types of comments or posts with formulaic structures. However, for the doodles or occasional flashes of brilliant nonsense that I come across while training the bot, I created a subreddit /r/markovpoetry where my bots (and other users) can post amusing grammar generated by their text-generation programs. The full code for this project, along with sample corpora, can be found on my GitHub page. Posted on 08/17/2014 by gammacephei. This entry was posted in Uncategorized and tagged cfg, grammar, linguistics, Markov model, nltk, Reddit. Bookmark the permalink.